Image data of the Noto’s Satoyama and Satoumi Digital Archives shall be open to the public to promote secondary use of the data, such as the dissemination of Noto’s appeal and creation of new services. If you use the data on this site, please acknowledge the user agreement. The usage policy is subject to modification without prior notice. We cannot guarantee that the services provided on this site are without defect or bugs. Contents of the service may change or the service may be stopped without prior notice. In order to ensure the security of information, we will manage the information property pursuant to the “Ishikawa Prefecture Information Security Policy” as well as laws and regulations. Behavior that causes or may cause damage to the Noto Regional GIAHS Executive Committee or a third party. Behavior that harms or may harm the reputation of the executive committee or a third party. If a user causes damage to our committee due to a violation of the Usage Policy, he/she shall compensate for the damages. The executive committee is not responsible for any damage or loss caused by using websites linked to our website. The Noto Regional GIAHS Executive Committee holds the copyright of all the information provided in the Noto’s Satoyama and Satoumi Digital Archives (text, designs, visual images, sound data, movies, etc. ), except as otherwise specified, and such data is protected by the Copyright Law. When you use the data, please comply with the conditions specified below. Data can be used freely for private or educational activities, such as use in the classroom. In other words, the data may be used for the purpose of academic research and educational activities or for private use (for example, the data is printed out or saved on hard disks during lessons in schools or other non-profitable educational institutions, private or home use, or other purposes equivalent to these) without obtaining the committee’s approval under the Copyright Law. For works where the provider is indicated, please seek the approval of the provider for use. 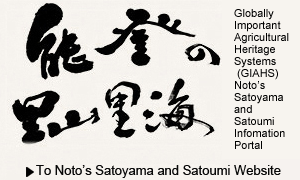 In principle, linking to the Noto’s Satoyama and Satoumi Digital Archives is free. It is not necessary to inform us of it beforehand. However, when you link to our website please inform ussatoyama@pref.ishikawa.lg.jpof the URL to be linked from. If the contents of the website linked are against the law or contrary to public order or morality, we may request the removal of the link.